This is a great approach, integrating exegesis, history, systematic theology, and application. This last section was especially great in most of the chapters I read. It’s true that the study of theology involves the danger of divorcing the knowledge of God from “real life,” but it’s also true that the true knowledge of God, the ground of all reality, is invaluable in living in the real world.The application sections are dead-on in showing how our theology, good or bad, shapes our behavior, whether we admit it or not. Because this book was written by a variety of authors and covers a vast amount of material, it’s inevitable that everyone will disagree at some point. That was the case for me, although at most points I thought the treatments were fair even when I disagreed with the author. The chapter on salvation, for example, contained some misunderstandings of the doctrine of predestination (including an out-of-line comment that R.C. Sproul’s doctrine of God is similar to that of Islam!). But it avoided many of the common errors, and was a pretty good treatment of the Reformed view of predestination, considering that the author doesn’t hold that view. A second criticism is that the book is not really written on quite the popular level you might expect from the title. I still think Grudem’s Systematic Theology is the best reference for most churchgoers (without sacrificing academic rigor). Of course many laypeople will read Theology for the Church and profit from it, but it will probably be more useful to pastors with some theological training. Criticisms aside, though, this book really is a gift to the church. The chapter “Introduction to the Task of Theology” is great; other standouts are “Special Revelation” and “Human Sinfulness.” The contributors are a who’s-who of bigshots in the SBC, but they quote extensively from outside that tradition, so the relevance isn’t limited. The historical overviews are a great resource, and the general zeal for the importance of theology in the life of the church is catching. 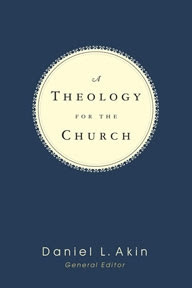 A Theology for the Church deserves a spot on the thinking Christian’s shelf. wondering if you’ve read Oden’s Systematic Theology (the standard Arminian ST set) and how you would compare it to the others? I am taking Basic Christian Doctrine right now and reading through Oden’s work and find it interesting, though hard to read as he repeats himself a lot and references classic fathers so much that you have to wade through a lot to get the point sometimes.